It’s very important that your large dog and her puppies receive the right level of nutritional support to maintain continued good health for the mother, and the best start possible for her puppies. 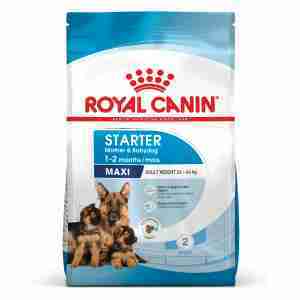 ‘Start Complex’ is the fruit of ongoing science from Royal Canin, the special formula is a great intermediary for your puppy, as it contains the right amount of nutrients to facilitate the first period of growth and change. When mixed with water the consistency of the food is very smooth and palatable, which is great for rehydration and easy consumption for both mother and puppy. This food contains all the nutrients required to support and maintain the good health of your dog and its litter. All of Royal Canin products undergo an extensive quality control process in order to guarantee the optimum quality of food as well as catering to your dog’s specific dietary requirements and lifestyle. This means when you feed your Dog and puppy Maxi Starter Mother & Babydog, they’re getting a complete and balanced diet.